46 is a composite number. 46 = 1 x 46 or 2 x 23. Factors of 46: 1, 2, 23, 46. Prime factorization: 46 = 2 x 23. 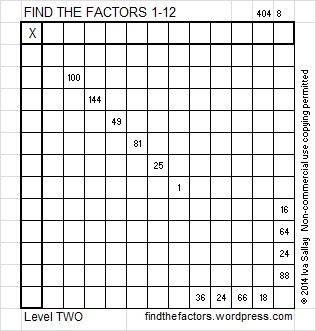 46 is never a clue in the FIND THE FACTORS puzzles. Wikipedia has a chart of 116 different directional arrow symbols. Each one of them has a name. Today’s puzzle represents the South East Arrow. To solve the puzzle write the numbers 1 -12 in the top row and again in the first column so that the numbers you write and the clues in the puzzle work together to make a multiplication table. Enjoying all the puzzle shared here in your website. Just one question , you happen to have a page where I can see the solution. I just want to check if I got the correct answers. I’m glad you are enjoying them! Thank you so much for your participation! There is an excel file on http://findthefactors.com/2014/03/17/happy-saint-patricks-day/ that has all the puzzles and answers up to that date. After that date I started updating each individual post with the answers or a chart. For the higher level puzzles the chart shows the order to go through the clues to find the factors using logic instead of guess and check. Each puzzle has only one solution. 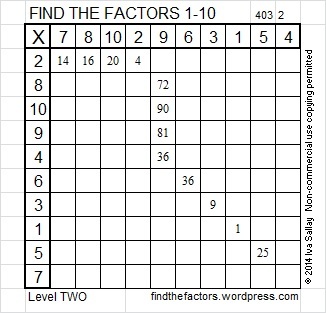 If the factors you found make all the clues work as part of a multiplication table, then you found the correct solution.